This awesome idea might appear a little creepy, for some it may seem like little fairies are hidden inside these beautiful dresses, to others, it may as well be ghosts! So this decorative outdoor lighting idea will probably make the best decoration choice for special occasions like Halloween. 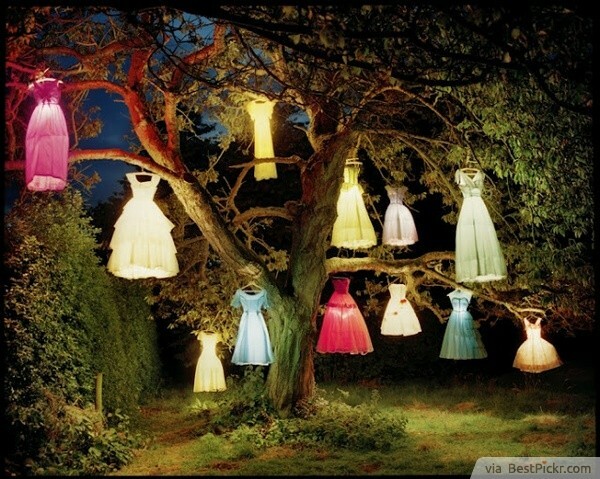 To make these cute glowing dresses follow similar steps to creating LED Cotton Clouds, only replace cotton with real dresses of your choice (ideally of kids size and see-through fabric, like chiffon) and hang them on cloth hangars with paper lanterns inside garments. Then you can also use cotton or other light fillings to stuff these dresses so they don’t fall flat.